Three men from a group calling themselves “Arabs with Altitude” ascended to the summit of Mt. Everest on May 22. Among them was Palestinian-American Raed Zidan, who lives in Indianapolis and Dubai. The 41-year-old climber became the first Palestinian man to scale the world’s tallest mountain. A Palestinian woman got there in 2011. 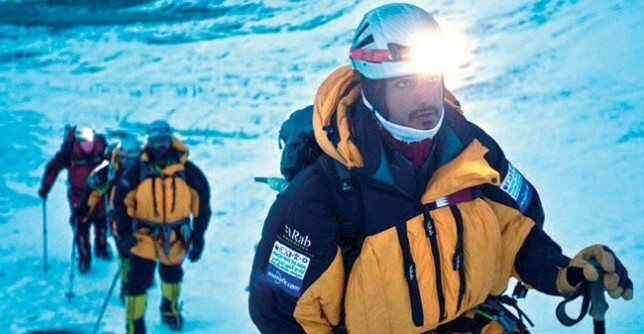 After four years of planning and preparation, a trio of UAE-based climbers reached the top of Everest yesterday. The group, calling themselves Arabs with Altitude, were Qatari national Sheikh Mohammed Al Thani from Sharjah, and Dubai residents Raed Zidan, a Kuwait-born Palestinian, and Iranian Masoud Mohammed. They reached the top of the 8,848-metre Himalayan peak at 10 am local time, according to their blog. The three climbers joined 35 foreigners, along with 29 Nepalese Sherpa guides, that comprised a charity expedition which is attempting to raise a million dollars to promote education in Nepal. A fourth member of the Arab group, Raha Moharrak, summited on May18, becoming the first Saudi woman and youngest Arab national to reach the top of the mountain. The first Palestinian and first Arab woman to make it to climb Everest was the Yaffa-born Suzanne al Houby. The UAE-based alpinist made her historic ascent on May 21, 2011. Palestine President Mahmoud Abbas on Friday telephoned leading Palestinian climber Zidan, who managed to raise the Palestinian flag on top of the ‘Everest’. And the pride of the President in contact with this achievement, he said, ‘is a pride for all the Palestinian people’, and thanked him for the effort to achieve this great feat. The Palestinian leader Zidane (41 years) from the village of Kafr standing near Qalqilya, was able to raise the Palestinian flag on top of the ‘Everest’ highest peak on earth. Zidane was born in Kuwait to Palestinian parents, a resident of the United Arab Emirates, and is married and has three children, Lydia, Lilian, Khalid, and his hobbies are driving fast and climbing. Zidan also succeeded earlier in arriving at the highest peaks of five continents of the world, and to raise the flag of Palestine on them, namely: Kilimanjaro is the highest peak mountain in Africa and is located in Tanzania (5850 meters), Mount Vinson highest peak in Antarctica (4890 meters), Mount Elbrus’s highest peak Europe, located in the Russian Caucasus (5642 meters), Mount Aconcagua the highest peak in South America (6942) and is located in the Andes mountain range, Mount Kosciuszko in Australia’s highest mountain (2300 meters).